This is the fourteenth post of our series of projects to make us thankful for DIY. Be sure to check back everyday during the month of November for new simple and easy DIY projects. As we approach Thanksgiving our thoughts turn toward our families and our stomachs. 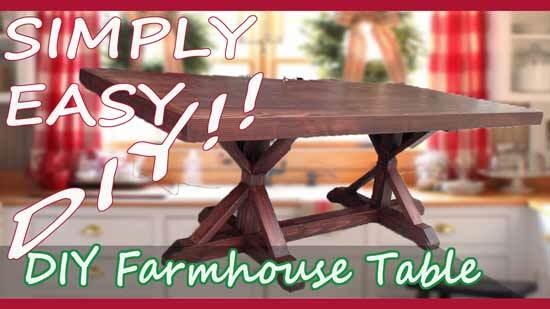 Here at Simply Easy DIY, we have a formal dining set that's 40 years old and made from maple. Here in Florida, houses often do not have separate kitchens and dining rooms. We are lucky in some respects to have both rooms so we can accommodate two tables. One for everyday dining that the kids can bang on as they please and one for special occasions such as Thanksgiving. Some folks don't even have a dining room though. They've got a "modern floor plan" with a "great" room that is a kitchen and dining room combined. So what do you put in these spaces? How about a "farmhouse table". That does make sense. These types of tables seat a lot, appear sturdy and evoke fond memories of the past. So where do you find one? Turns out, it's really hard. To get your hands on an authentic antique one, you might fork out thousands of dollars. So, that leaves you turning toward buying the cheaper offshore made ones. Not surprisingly, for this price point these tables aren't even made from full planks or even from real wood. You might also get a plastic finish. Now I'm not so hauty as to snub my nose at that but, you do have other choices. Make your own or as I say, "Make a simple and easy DIY one." The folks back at the original Thanksgiving made their own table and so can you! A project like this is all about what you want and the style you're going for. However, there are a few things to be mindful of when picking any lumber product. 1. Make sure the boards you choose are straight and true. When I'm at the lumber yard I inspect every single board before purchasing. I look down the length of the board to make sure there are no twists or bends. 2. Make sure the boards are free of loose knots. Knots are known weak points in a board and can become a safety hazard in the final project if not dealt with properly. When in doubt, just avoid if possible. The one caveat here would be if you are going for the knotted look but even then loose knots are not desirable. Plus if you've ever ran a loose knot through your table saw and had one pop out at you, you know it doesn't feel good. So my recommendation is to just stay away from them. I hope you enjoyed today's featured project and don't forget to stop by "CMR Woodworks" YouTube channel to check out even more great woodworking videos from him. Don't forget to subscribe.